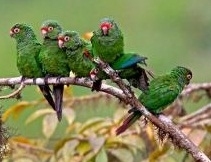 To help secure a future for the Critcially Endangered El Oro Parakeet and to protect it's forest habitat. Buenaventura was established in 2000 by Fundación Jocotoco to protect the recently discovered El Oro Parakeet — one of the world's rarest parrots. The reserve represents the only protected area of the cloud forest in this region of Ecuador and the only protection for the parakeet (with about half the world's known population) and the only known location for several species of plants and amphibians. reserve size: 2250 hectares; 277 ha acquired with this project. Our partner Fundación Jocotoco is an Ecuadorian conservation organization founded in 1998. One of the organization's founders is Canadian David Agro, who is an ICFC Associate and Chairs Jocotoco's Board of Directors. Since the reserve's inception, Jocotoco has been working to expand the reserve as desirable properties become available. The a properties have been reforested with native tree species that had been cut down for cattle grazing — the main threat to the area. A second threat to the area is lower precipitation resulting from the reduction in cloud cover due to deforestation. This causes species to migrate to wetter, higher elevations. The land on offer now is at a higher elevation, hence is especially valuable. Buenaventura is located in an area with a key concentration of endemic biodiversity (see Appendix). The reserve is the only known location for several species of plants, and the last refuge for various animal species. In addition to the El Oro Parakeet, the enigmatic El Oro Tapaculo also depends on the Buenaventura Reserve for survival as does the Ecuadorian White-fronted Capuchin. Many of these species are not otherwise protected in Ecuador's already fairly extensive national system of protected areas. A great opportunity arose in 2013-2014 to expand the Buenaventura Reserve by purchasing the adjacent 277-hectare Ramirez farm property for the below-market price of $200,000, of which ICFC contributed $50,000. Other funders included Rainforest Trust and American Bird Conservancy. Over half the acquired property consists of pristine subtropical rainforest, critical for the endemic el oro parakeet and tapaculo and at the perfect elevation for the parakeet. The remainding property consists of scattered pasturelands that are being restored through natural regeneration and some tree planting. In late 2015, a further 382 hectares were added to the reserve, this time with support from Rainforest Trust and supporters of Fundación Jocotoco. The reserve now spans 2250 hectares.